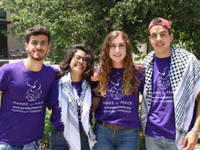 CARLSBAD, CA – While the decades-long Israeli-Palestinian conflict continues in the Middle East, students from Israel, Palestine and the Unites States spent the summer crossing borders, breaking down walls of conflict and building bridges toward peace through the Hands of Peace program in San Diego County. Hands of Peace is a three-week program in Carlsbad that brings together Israeli, Palestinian and American teenagers for dialogue, conflict resolution and leadership training. For the protection of the students, their last names and the identity of the host school for the peace-building program will not be disclosed. “We empower young leaders to raise their voices as future agents of change,” said San Diego Site Director Sarah Heirendt. In college, Heirendt studied abroad and spent time volunteering at a refugee camp in the West Bank. Ever since then, the conflict has been close to her heart, she said, and inspired her to pursue a master’s degree in conflict resolution and analysis at George Mason University in Virginia. For three years, Heirendt has overseen the Hands of Peace summer program and year-round projects that take place in the San Diego region. “It’s really emotional to see the bonds that are formed here – how close these teens get in just three weeks,” Heirendt said. Hands of Peace launched 15 years ago in Chicago as a way to help end decades of conflict in the Middle East. Founded in 2003, the nonprofit organization was started by members of Jewish, Muslim and Christian communities who share the conviction that peace can be nurtured, one person at a time. The San Diego program, now in its fifth year, served 46 students this summer, including 20 Americans and 26 teens from Israel and the Palestinian West Bank. Many of the participants have experienced violence and loss as a result of the ongoing Israeli-Palestinian conflict. “I live the conflict every day,” said second-year participant Amir, a 17-year-old Israeli Jew from Jerusalem. Prior to participating in the program, he had never met a Palestinian. “I wanted to be part of Hands of Peace to meet other people, see their perspective and hear their stories,” he said. Sama, a 17-year-old Palestinian from Haifa, Israel, has also participated in the program for two years. The summer program centers on daily conversations led by professional facilitators, in which teens share personal stories and discuss ways to build peace. They also take part in team-building exercises and educational activities to break down the walls of hate, prejudice and misunderstanding. Activities include visiting a synagogue, mosque and church, serving food to homeless and underserved people, designing and painting peace-themed murals, and participating in a ropes challenge course. Every year, participants also visit Border Field State Park at the U.S.-Mexico border to talk with teens from Mexico and learn how borders affect people around the world. “It was really hard seeing the border between America and Mexico,” said second-year participant Omar, a 17-year-old from the West Bank. Although 17-year-old Shayna lives in the San Diego region, she has never visited Mexico or even got close to the border before participating in the program. The long-term goal of Hands of Peace is for graduates to use their experiences to work toward peace and help end the conflict. There are more than 500 alumni living and working for peace across the United States and around the world. Sama recommended other students to apply for the program. 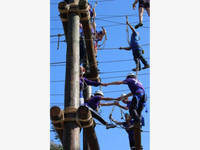 Through Hands of Peace, San Diego teens are currently working on a program that focuses on tolerance. 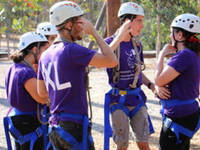 Israeli and Palestinian teens are working on a number of activities, including a dialogue project between a Jewish school and nearby school of Palestinian Citizens of Israel, programs for hospitalized children in Haifa, and raising awareness of differently-abled people in the West Bank.